Chivas Regal is synonymous with celebrating the journey of life. Through its 'Live with Chivalry' campaign, Chivas has been helping the modern man interpret the values of chivalry in the today's context. The Chivas Studio is designed to showcase these values through contemporary art, fashion, photography, installation and performing art under one umbrella and has featured some leading artists, musicians and fashion designers from India and the world. The collaborations were around the themes of fashion broadway, contemporary art and installations, and music and photography. The Circus of Life by Shekhar Kapur & Manish Arora: Critically acclaimed director and producer, Shekhar Kapur joined forces with renowned fashion designer Manish Arora for the show that combined their individual brilliance and produced a magical kaleidoscope - rich in colour and human emotion. The event combined storytelling and haute couture on a canvas as magnificent and grand as life itself. Sirius by Karan Johar & Manish Malhotra: What do you get when the master weaver of grand cinematic dreams and the premiere fashion designer of Bollywood come together? Sirius was a stylised vision of this brilliant notion. Khakastari by Rohit Bal: Often dubbed as 'The Master of Fabric and Fantasy,' Rohit Bal's creation are nothing short of a work of art that weave it itself folklore and fantasy to create magic. The master designer showcased a perfect blend that symbolised modern India, replicating the core essence of the brand Chivas. Bose Krishnamachari and Bharat Sikka The internationally renowned, Bose Krishnamachari is an immensely talented artist, curator of contemporary art and an art collector. The other installation is of Bharat Sikka, ace lens man known for documenting contemporary visions of India with a fine artistic approach. Some of his non commercial portfolio consists of environmental portraits of Indian Men, Urban Landscapes in India. Together with this, there's an Art Jam with Denver-based Live Art maestro Brian Olsen who will create live art to the beats of the musical rhythms of Mrigya. Also, Chivas Brand Ambassador Max Warner will give a creative twist to everyday flavours in Mixology Masterpieces. 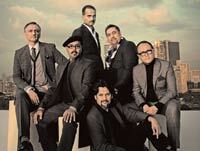 The Chivas Studio will unfold on November 26-27 in Delhi and December 10 -11, 2011 in Mumbai.